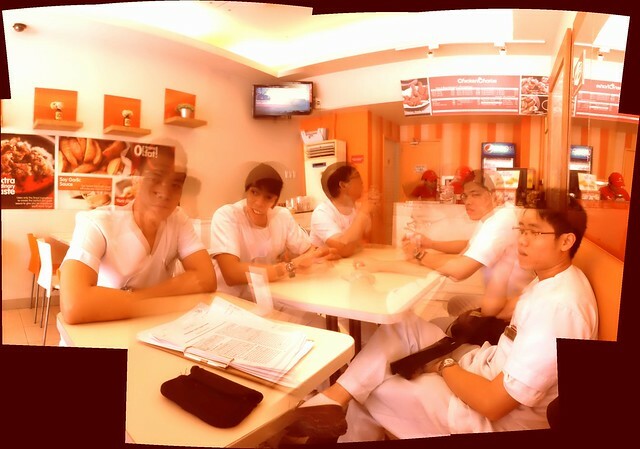 Stitched photo at Chicken Charlie, a small restaurant along Adriatico Street. 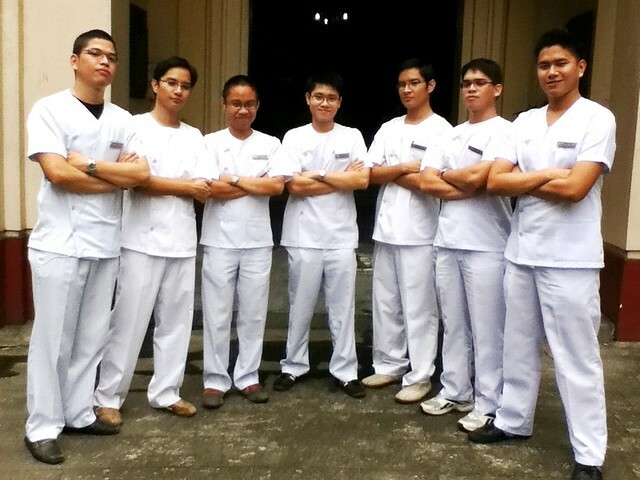 Taken 2011 in front of the UP College of Medicine building. I was the shortest. Dinner was at Nihon Bashi Tei. 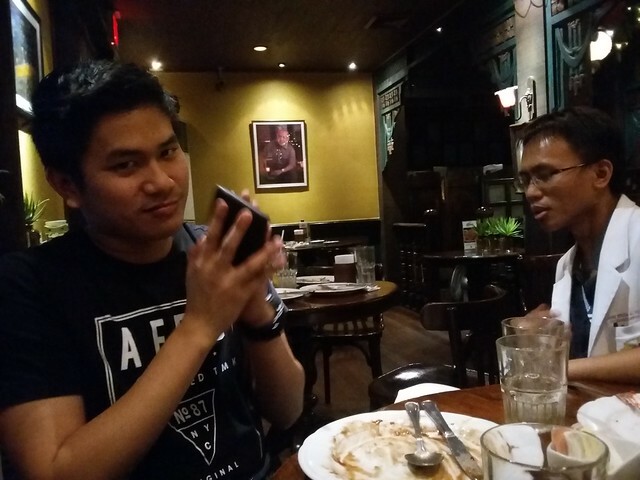 Dessert and coffee was at Café Adriatico. 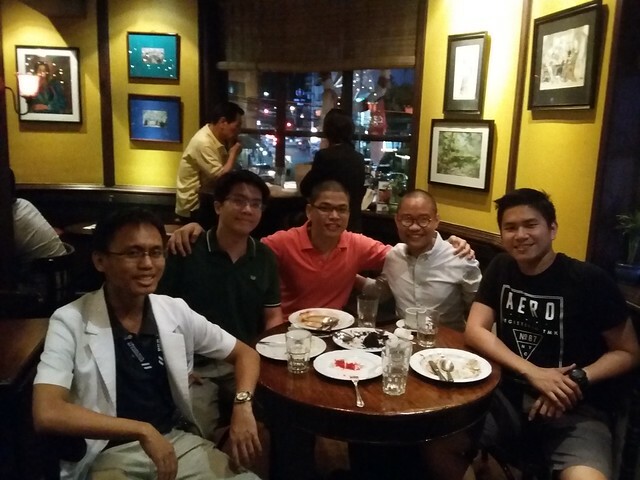 All in all, a great night with Aljur Ferrolino, Carlo de Guzman, Casti Castillo, and Bon Buño. 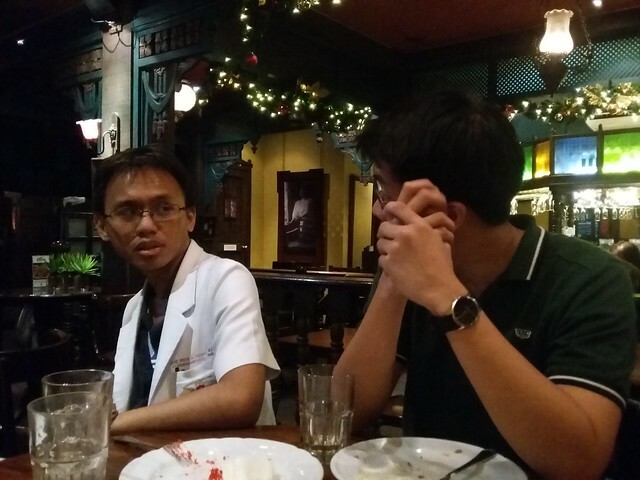 Aljur and Carlo are training to be an ENT specialist and a radiation oncologist respectively. Bon Buño is our future ophthalmologist; he promised to do yearly retinal detachment screening on me. They all love what they do, and I'm mighty proud of them. Why do you need retinal detachment screening? How high is your myopia? Is there some warning that detachment is impending? Not sure about whether there's a recommendation for retinal detachment screening for high myopes (mine is in the 500-600 range, not that bad), but my Ophtha friends have advised it. No loss of peripheral vision, thankfully—just blurring of vision when I take my spectacles off. When I still had a health card, one ophtha I visited recommended it (mine's the same as yours but also up to 275 astigmatism) but the other one who did the test said I should just avoid hard blows to the head (as if I wouldn't! haha). But I think it was because the first one misdiagnosed my grade and said it was 800-900 so I spent a lot on new glasses that didn't work for me--rather infuriating). 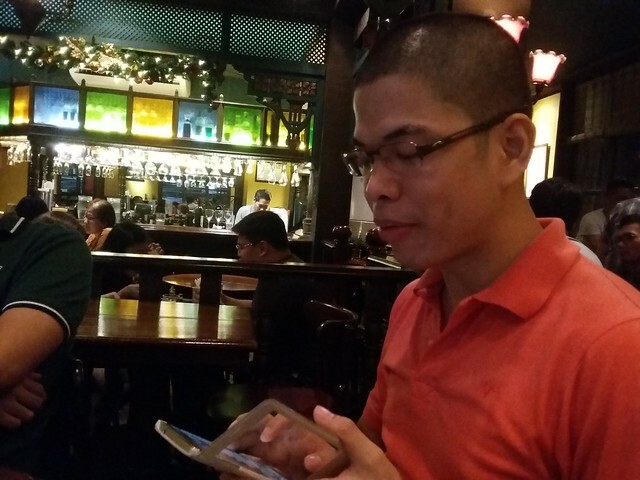 Anyway, I take blurred vision w/o specs as the norm for us myopics. Or is your blurring different? Your astigmatism is rather high—ah, the lenses must be expensive! I can't see things from afar; i.e., an arm's length from my head. No floaters or flashes of light or anything of the sort, though. I get the ordinary lenses. When salesladies ask me if I want them lenses ultra thin or multicoated or transitional, I tell them, "Gusto ko ng makapal para maduling sila kapag tinitingnan ako."